So, you want to be warm...yet you don't want a fuss. You'd love to be cosy on those nights in...and be rid of draughts, condensation and cold rooms. Comfort Solutions Ireland are the leading installers of External Wall Insulation in Connaught and offers the choicest systems on the market, just for you. Let us make your dreams come true during those freezing cold winters. 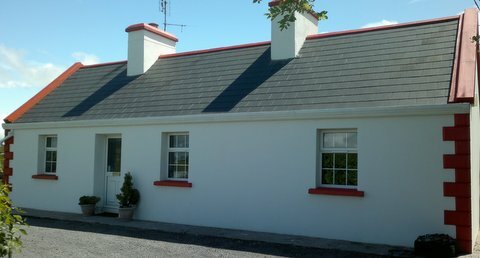 External Wall Insulation with impeccable quality, from Comfort Solutions Ireland. Dampness, mould or musty smells? As well as being unpleasant, this can be unhealthy for you and your family. We can offer you a real solution to poor air quality through the installation of a Lunos mechanical ventilation system. Hugely flexible in design and in price, we can tailor a system for your home, regardless of your budget. Improve your air quality now with a Lunos ventilation system. Comfort Solutions Ireland are proud to supply and install Kalor Wood Pellet Stoves. Kalor wood pellet stoves are the most efficient on the market and have a huge amount to offer in terms of convenience, design and reliability. From Air Stoves to Boiler Stoves and from Ductable models to Slimline models, there is a huge range to choose from and we are sure to have one that suits your needs. We have a brand new range just available now with even higher efficiencies (up to 98%!) and stunning new designs. A new grant for Solar PV (micro-generation) systems has just been announced and is available immediately. Insulation grants have also been improved for attic, cavity and internal wall insulation. For many people, perhaps including you, it has become almost impossible to keep track of all that’s happening in the area of home energy efficiency. It seems TV series Dragon’s Den features a new product or service every single week. For non-experts it can be very confusing. We’ve used our vast experience to find the best products on the market, and we present all of them to you here. External insulation. Loft Insulation. Damp-proofing. Wood pellet boilers. Wood pellet stoves. Solar hot water systems. Mechancial Ventilation with Heat Recovery. Air and Wind Tightness. Thermal Imagery. Energy Audits. Consultancy.